Definitive "Textbook" on Volunteer Management Is Now Better! "Life is not about waiting for the storms to pass...it's about learning how to dance in the rain!" Around the world, too many professional associations of volunteer resource managers are struggling. The Web offers the only forum in which people committed to advancing the profession can find one another and voice their opinions. Whether we work on a world-wide level or via one community at a time, virtually or face-to-face, we will make progress only if we perceive associating as power. Authors Steve McCurley and Rick Lynch have revised and updated their classic book, used in the volunteer management field for more than 10 years. With over 150 additional pages of new information, this third edition remains a thorough examination of every facet of a successful volunteer program, from planning and organizing through measuring effectiveness. Visit our online bookstore for a book excerpt, table of contents, and a list of the material added to this welcomed new edition. We've been mentioning the International Year of Volunteers + 10 and how individual volunteer projects can tap into the celebration. 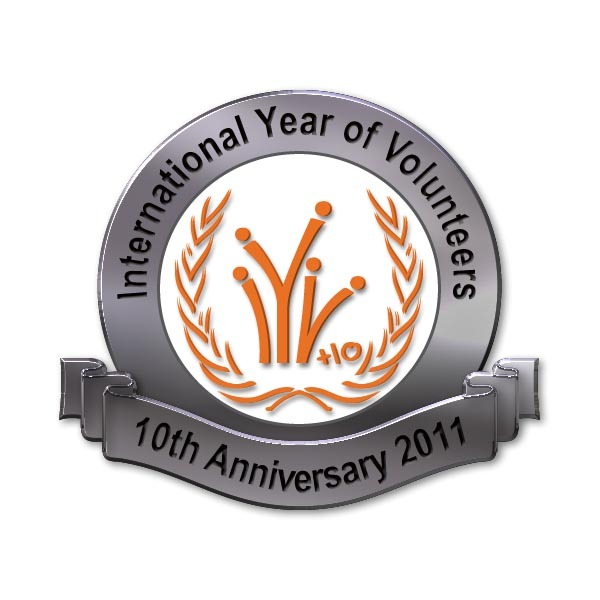 VolunteerGifts.com (Creative Designs & Marketing, Inc.), well-known to American colleagues for its line of quality, affordable lapel pins, has designed a special commemorative pin for IYV+10. It's available as a generic pin, shown here, for under two dollars (U.S.) each. A personalized version, in which the words "10th Anniversary 2011" appear on the bottom of the circle and your agency name is placed on the banner underneath, can be ordered for about a dollar more. Both pins are metal with raised lettering, enameled accents, and antiqued silver plating. Something different for volunteer recognition in 2011. Learn more at www.VolunteerGifts.com, or contact Rick Hyman at Rick@VolunteerGifts.com or 1-800-293-0032 (in North America). Susan Ellis' and Steve McCurley's Points of View essay, What is "Quality" Volunteering? Four more articles will be posted over the quarter and announced in this Update.